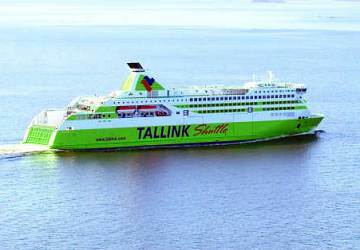 The modern 2000 passenger carrying Tallink Shuttle Star entered service in 2007 and operates year round in the Baltic Sea. The hull’s green colour reflects the environmentally friendly aspects of Star’s design which includes better fuel consumption, more modern technology and she creates much smaller waves compared to other high speed crafts! 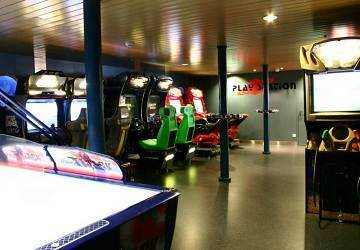 Onboard you’ll find numerous facilities to keep you occupied including a choice of restaurants (à la carte, buffet, pizza and café), a huge shopping area, children’s play area, a business lounge, an observation lounge (private parties), cabin accommodation and more. 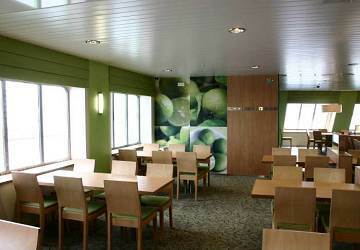 Tallink Star has a choice of en-suite inside and outside (sea view) cabins which can be found on decks 8 and 9 at the rear of the ship. 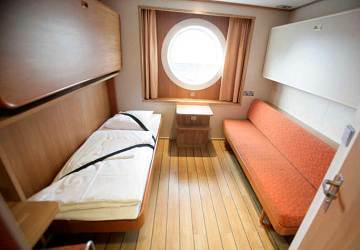 There are also cabins specially adapted for wheelchair access (located on deck 8). 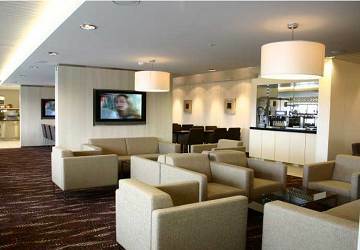 In terms of reserved seating you’ll find a 120-seat Business Lounge with wireless internet connection and TVs. 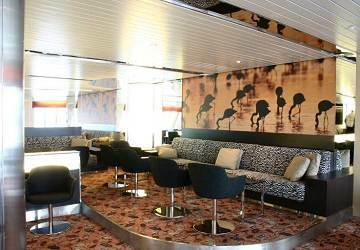 For private parties there is an Observation Lounge on the 9th deck for up to 250 persons. 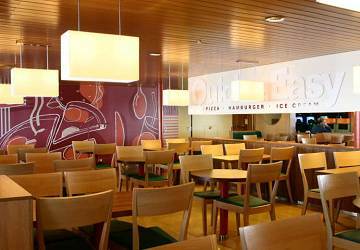 There’s no shortage of places to eat onboard the Tallink Star. 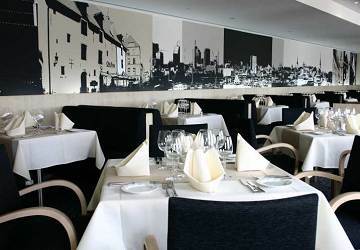 Take your pick from the versatile á la carte menu or head to the 450 seater ‘Shuttle buffet’ restaurant (located on deck 8 at the front part of the ship) which serves a buffet breakfast on departures in the morning and a warm buffet Lunch or dinner on other departures. 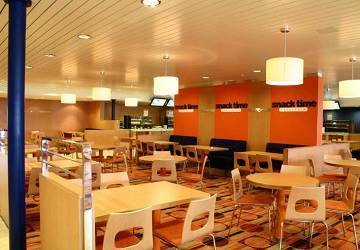 ‘Quick & Easy’ is in the middle of the ship on deck 9 and serves delicious pizzas, hamburgers and ice cream while ‘Café Snack Time’ (deck 8) offers sandwiches, rolls, salads, pastries, drinks and warm dishes. 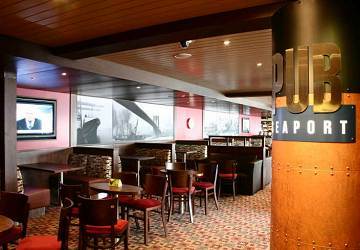 If you fancy a relaxing beverage onboard then head to the ‘Seaport pub’ on deck 7 at the rear of the ship for various drinks and snacks while in the Sunset bar (deck 9) you can admire the beautiful scenery and enjoy a refreshing drink. 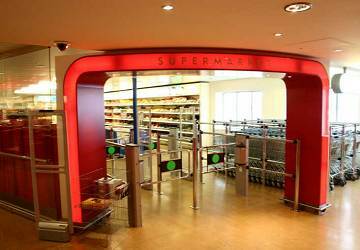 Tallink Star features 1500 square metres of pure shopping on deck 7! 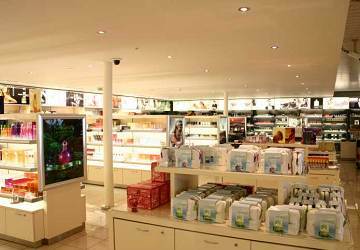 In the supermarket you will find alcohol, cigarettes, sweets, toys, souvenirs and food while in the perfume shop you will find a wide selection of perfumes and cosmetics. 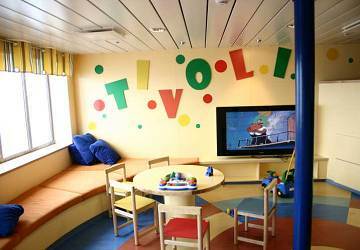 Children are well catered for onboard the Tallink Star with a dedicated a playroom which can be found on next to the Quick and Easy restaurant on deck 9. Please Note: Whilst we have taken great care in making our Tallink Star guide as accurate as possible, onboard facilities, services and entertainment may vary depending on the date and time of year that you travel, facilities mentioned may change without notification and ferry companies reserve the right to operate vessels other than those mentioned at time of booking without prior notification. The boat was wonderful, super confortable plenty of room and lot of things to do inside. They even offer internet for free. On time and a great trip. At times it did not even seem we were moving forward. Very nice trip from Helsinki to Estonia. Very enjoyable. Had great time. The Star was a good ship but the new Mega Star is really fantastic. These ships are comfortable,clean, and pretty. "1 day in Helsinki "
A very pleasant and comfortable journey. The shop was exceptionally clean . All facilities were catered for . "Lovely daytrip to Tallinn from Helsinki "
Booked a ferry to take us to Tallinn for the day. I was very pleased with the ferries booked, they left on time, there was plenty of facilities and entertainment on board and we generally enjoyed the journeys. Had to do some research to confirm what terminal we leave from in Helsinki because there is two terminals. Would like to have that information attached to the booking but apart from that I was very pleased with the service. Very pleasant experience through-out from beginning to end. Very modern facilities at ferry terminal at Helsinki, I was very impressed! Ferry was very modern and clean. Plenty of room for everyone on board. Excellent facilities, eg sockets to charge phones, lockers etc. Food acailable was amazing. Thanks so much, kiitos! Our trip from Helsinki to Tallinn on Direct Ferries was an easy and comfortable excursion that left us in the Downtown area with easy connection o our hotel It was our first experience and it was quite smooth. We booked on line and had no trouble in the process. The ship was beautiful and it was funny. The return was a bit different because it was at 22h30 and the passenger were not the same ' type '. But it was O.K. Very good experience. No delays, timely check in, boarding, departure and arrival. Good luggage storage facility and friendly staff. Boat was on time and ran perfectly!